Black Friday is almost upon us! 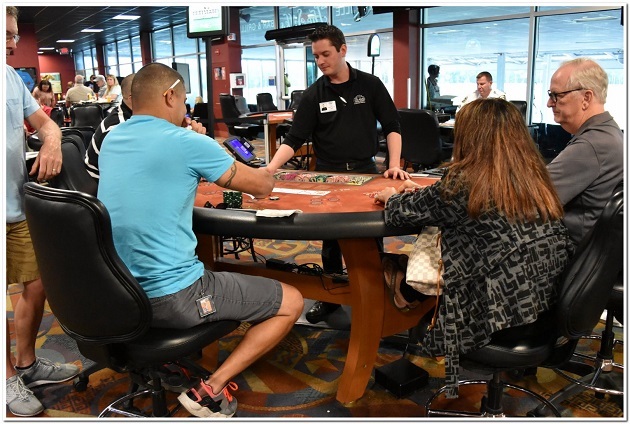 For anyone who dreads how much money they’ll spend during the holiday season, or anyone who wants to avoid the whole shopping frenzy altogether, Silks Poker Room at Tampa Bay Downs is offering some fantastic high hand bonuses during their Texas hold ‘em cash games on Friday, November 23. Play your cards right at Silks on Black Friday and you can line (or maybe reline) your pockets during the “Shop ‘Til You Drop And Win It All Back” event. The bonuses start at 10:00 a.m. on Black Friday, with high hand payouts every 15 minutes. Here’s how much you can win for your high hands from 10:00 a.m. until 4:00 p.m. The highest qualifying hand every 15 minutes gets the cash. $300 for a winning “aces full” hand (a full house which includes three aces). You must use both of your hole cards to qualify. Starting at 4:00 p.m. and continuing through 1:00 a.m., the high hand bonuses will be paid out every 30 minutes. Any winning four of a kind or higher hand, using both of your hole cards, qualifies you to win $500! The highest qualifying hand every half hour takes down the bonus. Finally, if you’re lucky enough to make a royal flush using both of your hole cards at any time on Black Friday, you automatically win $1,000! That's a great way to celebrate the Thanksgiving in Tampa holiday! In addition to the cash game action on Black Friday, Silks will offer an ultra stack no limit Texas hold ‘em tournament starting at 7:00 p.m on Friday night. The entry fee is $55 for 10,000 chips, and you can buy another 5,000 chips at the beginning of the tournament for just $5 more. The tournament uses the big blind ante format, where the big blind pays the antes and blinds for the entire table. Silks Poker Room will be closed on Thanksgiving... but after you spend time with your family on Thursday, come spend time with your poker family on Black Friday at Silks and take a shot at some big bonuses! Looking for more things to do on Black Friday? Wondering what’s happening around Tampa during the holidays? Check out 813area, and make sure you sign up for the free email updates to stay on top of all the big events around town.